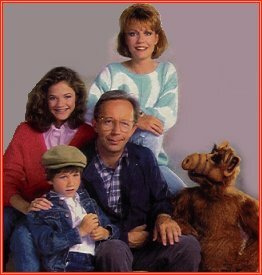 ALF is the farcical story of a smart alec alien crash landing into an Anywhere, USA's family's garage. This family is Willie Tanner, his wife Kate, their daughter Lynne and son Brian. 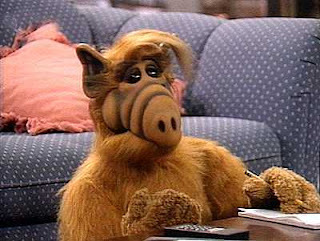 They decide to call the alien "ALF," which is an acronym for 'Alien Life Form.' ALF's "real" name is Gordon Shumway. ALF can speak English, but never tells them to call him Gordon (as far as I know). The Tanners must deal with ALF's out-of-this-world behavior and keep him hidden from their nosy neighbor Mrs.Ochmonek. The eleventh episode takes the family out of their comfort zone. After ten episodes who isn't ready to break away from the monotony of the "traditional" ALF formula? At first Willie contemplates going to California, but they cannot leave ALF home alone. He even goes as far to set the kitchen on fire to prove this point so expertly. Plus, he wants to eat their cat. That's the thing about ALF, he eats cats. Melmac, his home planet, was apparently well-stocked with felines. I don't know if cats are from Melmac and came to Earth or if Earth cats built a ship and sailed to Melmac. Hopefully the twelfth episode will explain. Willie decides to rent an RV and go camping deep in the woods where nobody will see ALF. Once they get to the camp site it begins to rain. ALF complains and makes smartass comments. Willie explodes on ALF, causing ALF to leave the RV in the rain. ALF wanders into a backwards country home. Maybe some houses deep in the woods aren't backwards country homes, but I have yet to see otherwise, especially in absurdist TV comedies. ALF heads to the cabinets and chows down on some Oreos. He hears the home owners coming home so he scurries under the bed. These backwards country folk are all about hunting and not leaving food out on the counters. This is how they become aware that something is out of the ordinary. They would never leave Oreos out, especially while they're off decapitating deer with a chainsaw. The fatter one sits on a bed and finds ALF. They think ALF is an anteater. They also think shooting anteaters is illegal. It's not, obviously. At least not when this show was produced. The fatter one leaves to get a chainsaw or sawed-off shotgun. ALF tries to reason with the thinner one, which just confuses him because anteaters don't normally speak English. When the fatter one returns to kill ALF Willie shows up. He pays the guys off and returns to the RV with ALF. They drop ALF off at home and go on vacation to California. ALF doesn't burn the house down. The moral of the story is to always trust ALF. As far as absurd shows about aliens living on Earth, I would say ALF is the best. Mork and Mindy is bad because Robin Williams is awful. Third Rock From the Sun stars French Stewart. I know that Willie on ALF infamously smoked crack with a transvestite, but at least he gave a good performance in this show. The way they shot ALF was by using a series of trapdoors to allow the puppeteers to control ALF virtually anywhere on the set. If you were a fan of pro wrestling for the Ultimate Warrior's WCW run then you know that trap doors are dangerous. Even if you didn't see that you might still be understand how dangerous trap doors can be. This was great. What happened to the kid from ALF? haha, jake. you are my hero. This is so funny, you should do more!@! Thanks Maddie. You're my hero 2. I'll do more reviews/recaps soon. I want to do one on Family Feud for next Wednesday. The kid from ALF left acting, sadly.